The Miner's Cottage in Jerome is a great destination for your next Arizona vacation. This revitalized town has many exceptional shops and art galleries, great restaurants and saloons, enough events to be interesting and enough quiet to be relaxing. Being centrally located between Prescott and Flagstaff, Jerome is a perfect home base to explore the entire northern Arizona region from. Drive to Sedona, Prescott, Flagstaff and even the Grand Canyon. See Area Attractions for more information. Due to the abundance of copper in the area, Jerome's roots lie in the mining industry. Prehistoric Native Americans were the first miners, Spanish gold hunters also came here. By 1883, a mining camp named Jerome (for mining investor, Eugene Murray Jerome) was established atop "Cleopatra Hill" and United Verde mining operations began. Americans, Mexicans, Croatians, Irish, Spaniards, Italians and Chinese all flocked to the mining camps. The United Verde Mine is said to have produced over one billion dollars in ore.
During it's boom years Jerome became a notorious "wild west" town, a hotbed of prostitution, gambling, and vice. On February 5, 1903, the New York Sun proclaimed Jerome to be "the wickedest town in the West." Once the mines finally closed in 1953, the population went from a peak of 15,000 (in the 1920s) to roughly 50 persons. Buildings were boarded up and the town began to be called Ghost Town. 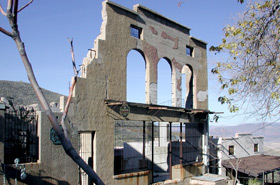 The Jerome Historical Society saved the buildings against vandalism and the elements, the Douglas Mansion was made a State Park in 1965 and Jerome became a National Historic Landmark in 1976. 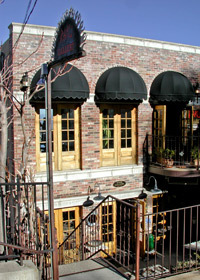 Jerome became a haven for artists during the 60's and 70's. And has slowly transitioned into a tourism destination. Over the years, fires and landslides have damaged large sections of Jerome, but despite the destruction, remnants of the "red light district," Company Hill, old hotels and saloons, still exist. Today, Jerome is alive with writers, artists, musicians, historians, and families. There are many opportunities to explore and discover it's rich history while enjoying an abundance of modern conveniences. From the historic sites to the area's natural beauty, the unique shopping to the nearby attractions, Jerome has something for everyone. Make the Miner’s Cottage your getaway for a weekend, a week, or longer. Jerome is about a 2-hour drive north of Phoenix, or a 1 1/2-hour drive south of Flagstaff. From Interstate 17 take the off ramp at the Cottonwood-Camp Verde exit. Travel west on State Route 260 to the Town of Cottonwood and follow the signs to Jerome up Route 89A.